Our newest project, and the ninth diving center in Egypt, has now opened its doors in April 2017 and offers the diver a species-rich house reef, many boat dumps and ultimately brand new Aqualung equipment. Nitrox 32 is also available to all trained divers - free of charge. The hotel Citadel Azur Resort, which is distinguished by its exceptional architecture with lots of charm and excellent food with different themed restaurants, is located directly at the northern end of Sahl Hasheesh Bay. The resort is perched on a hillside, above the Red Sea and the hotel's spacious lagoon with its harbor and, of course, the newly opened EXTRA DIVERS diving base. Hasheesh is the Arabic word for grass, but in this case it means only the sea-grass under water. Currently there is still some fine tuning going on at the dive center, but diving itself is already going and the first satisfied guests were already in or under water. 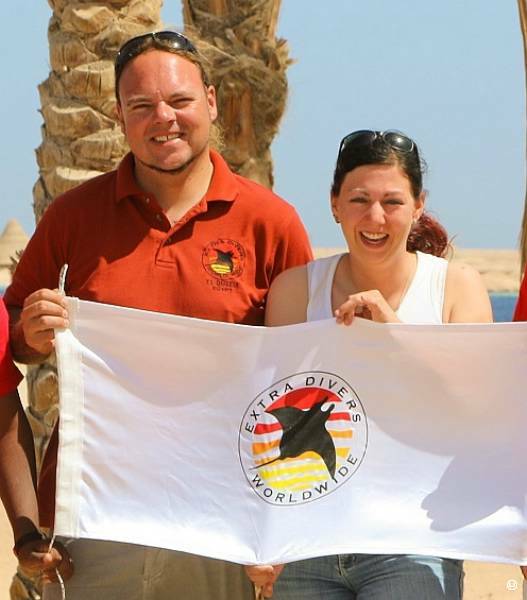 Marisa Baumanns & Robert Mutzbauer have taken over the management of the center, maybe already be known to some of you from our center in Sharm El Naga. The whole team is looking forward to seeing you all, and they are all super motivated to make unforgettable dives at our new EXTRA DIVERS dive center in Sahl Hasheesh, Egypt. 542, - € p. P.
When booking until 30.04. you get a free upgrade from ocean view to deluxe ocean view! Exclusively and only bookable at Reisecenter Federsee!